UpFront with NGS: MyHeritage Membership Offer for NGS Members Last Chance! MyHeritage Membership Offer for NGS Members Last Chance! 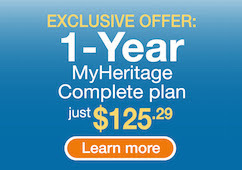 Reminder, the special MyHeritage offer for NGS members will end of Monday, November 21st. Sign up before midnight on Monday, November 21st to get 50% of Full Access to everything on MyHeritage.